For sheer nihilistic violence and character die-off rates, one of the few TV shows out there that could give Game Of Thrones a run for its money is Attack On Titan, the hugely popular anime series about people being eaten alive by towering, nearly unstoppable humanoid monsters called Titans. The 25-episode series, which launched in 2013, is based on an immensely popular ongoing manga series, which tracks the fighters trying to defend humanity as the Titans break through their enclave walls and devour the increasingly desperate survivors. Texas-based anime distributor FUNimation Entertainment picked up the North American rights to the series (which is now streaming on Netflix Instant), and has followed up by nabbing the rights to the latest iteration: two back-to-back live-action movies due out in Japan later this year. Attack On Titan has garnered so much attention—the manga compilations are bestsellers, with 45 million volumes in print—that it’s natural for it to have spilled over into any other media that would support it. At this point, there are already Titan videogames and novels. So the logical next step was for longtime giant-monster specialist studio Toho to bring it to the big screen. Toho’s versions were actually in planning before the anime series came out, but Marvel-style creative differences with directors and complicated special effects seem to have delayed production. 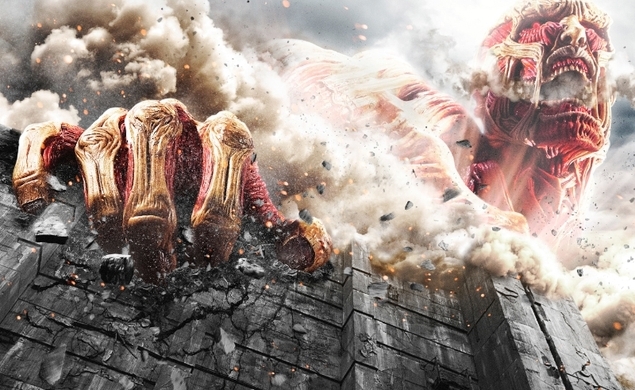 But as of this year, the two live-action films are coming to Japanese theaters back-to-back after stopping in the States first: Attack On Titan will get its official world première at Los Angeles’ Egyptian Theatre, on Tuesday, July 14. It opens in Japan on August 1. No word yet from FUNimation on rollout dates for a broader Stateside release in theaters or on home video, or on première plans for the second film, ominously titled Attack On Titan: End Of The World, and due out in Japan September 19. Director Shinji Higuchi is an animation veteran—one of the helmers on the classic, beloved 1990s anime series Nadia: The Secret Of Blue Water—who went on to make effects-driven live-action spectacle like the 2012 historical comedy The Floating Castle. It’ll be interesting to see how Toho and Higuchi condense a still-running comics series (or a 25-episode anime) into two films, but the international trailer released in April suggests the live-action version will stick closely to the basic idea of the series, with all its potential for spectacle, while jazzing up the effects considerably and streamlining the characters. And also making them pull really stupid stunts like standing in front of a massive wall and saying, “Why do we even need these walls? No one’s seen a Titan in a century! They’re just myths! There’s certainly no possible way one could come over this wall and eat us all slowly and horribly right this minute!” Hint for the future: If you ever find yourself stuck in a grim post-apocalyptic future where humanity stands to be destroyed at any minute, do not do this, regardless of whether you’re in the animated, live-action, comics, literary, or video-game version.